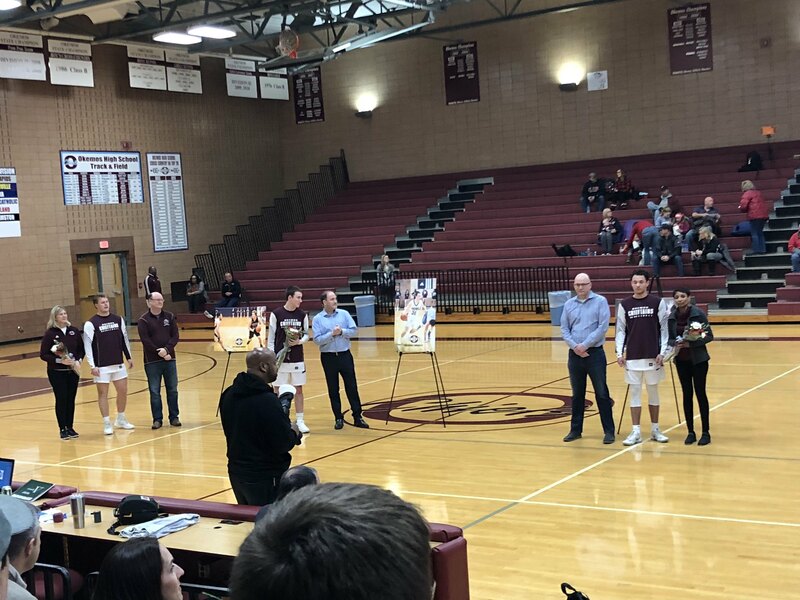 OKEMOS - Since the fourth grade, Okemos High School seniors Jordan Henry, Patrick Nugent and Gerald Sambaer III, have been playing basketball with each other, and tonight they were able to cap off their senior night celebration with a 47 to 31 victory against St. Johns High School. The night started off with a small ceremony where each senior would walk to the center of the court with their parent(s) after being introduced. Although they are going separate ways after high school, each player agreed that their best moment as an OHS basketball player was when they beat East Lansing last week to capture the CAAC Blue Conference Title. Tonight’s victory however, added a sweet touch to an already bitter sweet night. OHS senior, Jordan Henry started the game off in a way his coach would consider ‘Jordan like’. He would score the first basket of the game, and have 10 of Okemos’ 12 points after the first quarter. Despite holding the Redwings to four points in the first quarter, St. Johns would gain momentum in the second quarter. After a few defensive stops and some baskets on the other end, the Redwings would hold the Chieftains to only two points and tie the game up at 14 with 2:35 left in the half. Okemos would enter the half with a 17-16 lead. In the third quarter the Chieftains would start to pull away. OHS begin to capitalize off of turnovers from the Redwings and Okemos would go on to win the game 47 to 31 and end their season 16-4. Okemos will play in the MHSAA Class A District finals against Lansing Everett, a team they beat twice this season, on Monday at 6 p.m., at Jackson High School. “[Losing the seniors] will be something that is sad when it's time to go, but we don’t plan on being done anytime soon,” said Coach Wonch. “But they have brought so much and I'm so proud of them.